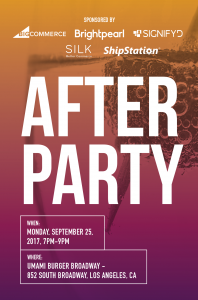 You are invited to join us at a Shop.org After Party at Umami Burger where you can enjoy tasty burgers, drinks, and other fun features all on us! Come meet the leading eCommerce experts including SILK Software, BigCommerce, BrightPearl, Signifyd, and ShipStation who can help you navigate the channels of creating a successful online business. Get all of your eCommerce questions answered firsthand, mingle with our eCommerce experts and other industry professionals in attendance, and simply enjoy a fun night with great food, drinks, and company! We’ll also have cool giveaways including a Patagonia backpack, gift cards and more! Please note: You don’t have to be going to Shop.org itself to attend! We look forward to seeing you there and hope that you can join us!